While militant jihad is exploding throughout the world, westerners are both transfixed and terrified by an enemy whose blood lust is unquenchable – seeking nothing less than the total annihilation of western civilization. A scorched earth. Nancy Hartevelt Kobrin, Ph.D., a world-class expert on the psychoanalytical aspects of suicide terrorism and early childhood development, is the author of several books on this very complex, highly frightening, and, for the most part, unknown phenomena. 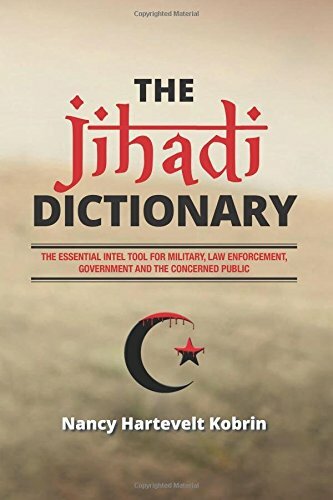 The Jihadi Dictionary: The Essential Intel Tool for Military, Law Enforcement, Government and the Concerned Public is her most recent exploration into the psychological mindset and dark recesses of the ‘black hearts’ of Jihadi terrorists. By meticulously identifying the core building blocks which are necessary for healthy mother-child bonding, Dr. Kobrin traces the inability of Muslim women to bond with their children to deep-seated cultural ‘norms’ which are endemic within the Muslim world. In turn, their offspring become profoundly scarred during the most primary and intrinsic developmental stages. This is the case for both sexes. By extrapolation, a vicious psycho drama dominates the psyche of countless Muslims across the world – petrifyingly so. Throughout, Dr. Kobrin expounds upon the primacy of the broken maternal cord, and its essence is succinctly encapsulated on page 258.
cord surfaces in much of the group’s bloody imagery, just like birth and the afterbirth. Similarly, within the book’s Conclusion (page 270), a bird’s-eye view into Islamic pathology – as it relates to Jihad in general, and suicide terrorism in particular – is exposed. which I believe is the missing piece in the thousand-piece puzzle of Islamic terrorism. In this reviewer’s opinion, the main value of The Jihadi Dictionary lies within its unique ability to merge the confused psycho-sexual components and dynamics of Jihadi terrorism, with a growing compendium of works which delve into the life and history of the Koran’s author, Muhammad. The Jihadi Dictionary serves as an invaluable explanatory companion to an emerging work of essays and books, namely, Islam and Blood: America’s Deadliest Enemy by Professor Paul Eidelberg, and It’s All About Muhammad; Was Muhammad Insane? by F.W. Burleigh. By examining the fundamentals of Sharia Law – Islam’s violent underpinning and wellspring – coupled with the pathology of ‘prophet’ Muhammad, unarguably, a madman, a toxic brew is always in the mix. The dictionary format is a particularly useful Intel tool for military, law enforcement and government professionals. It allows for quick referencing and cross-referencing; a one of a kind resource guide for practical application. Moreover, its basis can be utilized for immediate, intermediate and long-range strategic planning. More specifically, many of the aforementioned professionals – and the public alike – are in desperate need of ‘remedial’ education, regarding a lethal enemy which is fighting a 7th-century (mindset) war with the most advanced technology known to man. Most significantly, The Jihadi Dictionary acts as a desperately needed non-PC windowed mirror into the motivational forces behind Jihadi terrorism. By unveiling the driving and underlying cornerstone of its psycho-sexual roots, Nancy Hartevelt Kobrin, Ph.D. should be congratulated for her distinctive and courageous contribution to the most pressing issue of our time, Jihadi terrorism. The Jihadi Dictionary is must reading for all westerners. Adina Kutnicki is the co-author of BANNED: How Facebook Enables Militant Islamic Jihad (WND Books, September 2016). Her investigative work concentrates on Islamic Jihad and its western knock-on effects. She blogs at: Adina Kutnicki, A Zionist & Conservative Blog (www.adinakutnicki.com), and is a contributing author to several news sites. She is a consultant to a privately held Homeland Security entity. This entry was posted in Uncategorized and tagged mother-child bonding, Nancy Hartevelt Kobrin Ph.D, The Jihadi Dictionary by Adina Kutnicki. Bookmark the permalink. I just received my copy today from Amazon! I cannot wait to read it and use it as a reference!